In New York City, Skee-Ball For Grown-Ups Skee-Ball is a kids' game played in arcades and beach towns, but that doesn't stop grown-ups from competing. In New York City, the best Skee-Ballers from across the country gathered to roll the wooden balls into the numbered holes. The game isn't played for tickets and trinkets at the national level — the winner gets a trophy and a new kind of stature. The Skee-Ball stadium at the Full Circle Bar in Brooklyn. Bowling takes too much room. Darts are dangerous. Shuffleboard is messy. Skee-Ball is the bar game of the moment. Every kid who ever wandered into a Chuck E. Cheese's or spent a long afternoon in a beach town knows the appeal of the wooden balls. You hurl them up an inclined lane into numbered holes; tickets spew out; and the next thing you know, you're walking out with an armful of useless plastic trinkets. Now, Skee-Ball has the one thing it needs to make it a bona fide sport: a national champion. At the Full Circle Bar in the Williamsburg neighborhood of Brooklyn, N.Y., rollers from around the country got together to see who could rack up the most points. But this game isn't measured in tickets. Eric Pavony, the self-proclaimed Skee-E-O of the Brewskee-Ball Skee-Ball league, says he thought up the idea for competitive Skee-Ball on a trip to Coney Island five years ago. He figured out that if you treated the game like bowling — 10 frames each, 9 balls per frame — it would bring out the athlete in the Skee-Baller. Pavony and co-founder Evan Tobias came up with rules and terminology. A "full circle" is hitting the 40-point pocket with all nine balls (in other words, 360 points). A "cherry" is adding a 50-point pocket to the mix. A "hundo" is the ever-elusive 100-point pocket. They began a small Skee-Ball league at a bar in Manhattan. Five years later, the sport has exploded. The Brewskee-Ball league has more than 400 teams in California, Texas and North Carolina ("From skee to shining skee," Pavony says). Pavony even opened up what may be the first dedicated Skee-Ball bar in the country, the Full Circle. 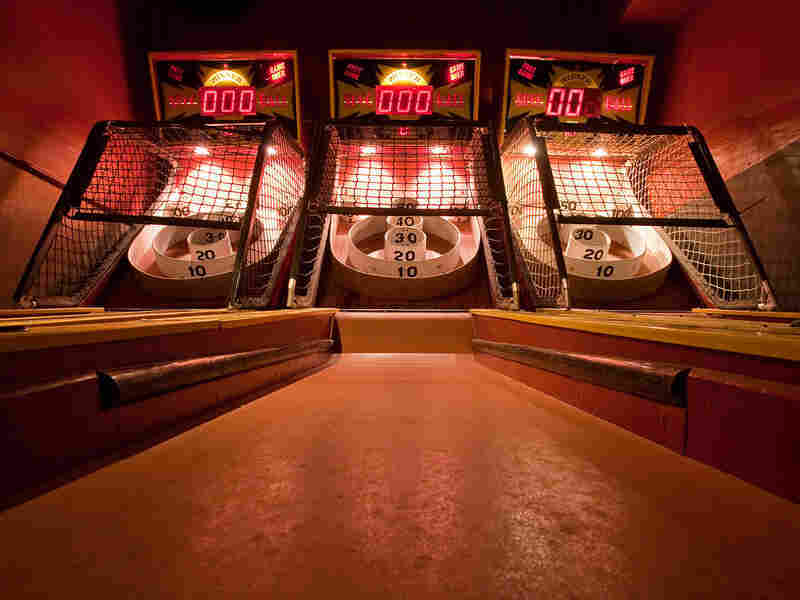 It features a Wall of Fame, and even a closed-circuit television feed of the Skee-Ball lanes so everyone can watch. On Valentine's Day weekend, the first national championship was held. Top rollers arrived from around the country — members of teams with names like Flock of Skee-guls, Skee-ven Colbert, Skee Patrol. Needless to say, there's a lot of drinking involved in this sport. When I meet the top-rated players before the competition, I notice something strange. They're all 5 foot 8 inches and under. Andrew Litz, who plays under the pseudonym William Ocean, has a theory. "This was meant as a child's game," he says. "That's why the lanes are so low. I think that being able to get down low to the lane, you have more success." They may be average height, but these rollers aren't exactly normal. Joey Mucha, aka Joey the Cat, wears a woman's leopard-print jumpsuit. He's from the San Francisco league, and there's a reason why he's so good. "I purchased my own Skee-Ball machine off of eBay, and it's in my one-bedroom apartment," he says. But you know what they say: On any given skee-day, any roller can triumph. And during the national championship, the top rollers fall one by one. Even the great Joey the Cat plays more unevenly than a carny's grin. "I was coughing up hairballs left and right," he laments after losing early in the night. What he didn't count on was one New York City player who has the stature of a champion. "I am 5'5" and a half on a good day," brags Ray Carannante, better known as Skee-diddy. "This is a short-man's game." Despite all the high-rollers and skee-lebrities in the room, Skee-diddy throws just one kind of shot, a 40-pointer. But he can do it all night without sweating. He's like a robot sent from a Skee-Ball-playing future. Or like a kid who grew up going to the Jersey Shore — which he did. His metronome-like arm propelled him to the finals — and the championship. And what does the winner get? Enough tickets to trade in for 170 pencil-top erasers and a Chinese finger trap? A little Skee-Ball joke there. Carannante gets a trophy, topped by a little gold man throwing a ball. It's really a bocce player, but what are you going to do? It's the first national skee-trophy ever made. But not the last.